Reading and share top 6 Carlos Pena Jr famous quotes and sayings. 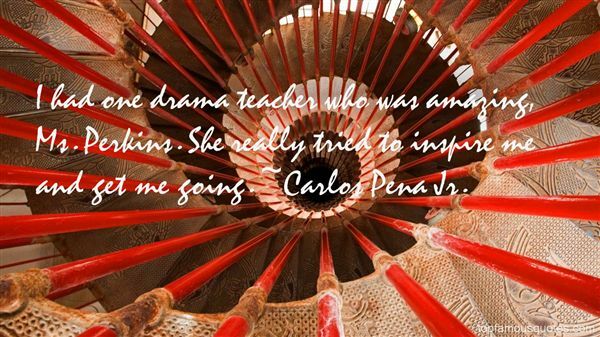 Browse top 6 most favorite famous quotes and sayings by Carlos Pena Jr.
1. "Here's the thing, back in the day, a lot of guys would make fun of me, that I would sing and dance, that I was a cheerleader. But I kept my head on straight. I had goals." ~ Carlos Pena Jr.
2. "I had one drama teacher who was amazing, Ms. Perkins. She really tried to inspire me and get me going." ~ Carlos Pena Jr.
3. "I was 13 and at summer camp when I had my first kiss." ~ Carlos Pena Jr.
4. "I hate meeting my favorite bands because then it just ruins it." ~ Carlos Pena Jr.
5. "I think that boy bands as a whole are really coming back." ~ Carlos Pena Jr.
6. "Well, c'mon, everyone is a Facebook addict!" ~ Carlos Pena Jr. The big one I missed out on was 'Cat on a Hot Tin Roof.' MGM wanted me for it, and Warner Bros. wouldn't give me permission to do it."